The holiday season at Disney World is almost here! 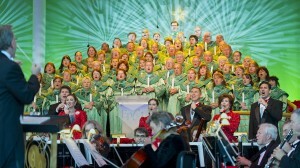 And we have exciting news – the full list of Candlelight Processional narrators has been announced. The Candlelight Processional happens three times per night at 5:00, 6:45, and 8:15 p.m. in the America Gardens Theater in the American Adventure Pavilion at Epcot. Admission to the performance is included in Epcot admission. Guests can reserve a Candlelight Processional dining package that includes breakfast, lunch, or dinner (depending on restaurant) and guaranteed seating at one of the performances. The Epcot International Festival of Holidays begins November 19 at Epcot but the first performance of the Candlelight Processional is November 24.